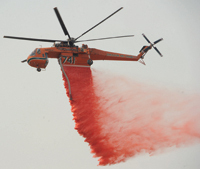 Numerous aircraft have been dropping tens of thousands of gallons of red fire retardant on Beaver Creek Fire lines during the last two weeks, in order to slow down the advance of the flames. The retardant is manufactured to be biodegradable, but can leave red stains in forests for some time. “These fire chemicals have been tested and meet specific requirements with regard to mammalian toxicity, including acute oral, skin and eye irritation tests,” said Robyn Broyles, spokesperson at the National Interagency Fire Center in Boise. “A small percentage of the population may have an allergy or sensitivity to the retardant, which is not uncommon for most chemical substances,” Broyles said. Broyles said the retardant is supplied by Phos-Chek brand products in Ontario Calif., and by Phos-Check and Fire-Trol brand products in Kamloops, British, Columbia, Canada. Known as “long-term fire retardant,” the red spray is 85 percent water and 10 percent fertilizer (made from ammonia and phosphate, or sulphate ions). The final 5 percent is composed of other ingredients, including iron oxide (rust), which causes the red coloring, and a thickener made of gum or clay, which keeps the retardant together when it is laid down from aircraft. Broyles said there are also unidentified corrosion inhibitors, stabilizers and bactericides in the mix. “Over time, the red color will fade with exposure to sunlight,” Broyles said. Because it contains fertilizer, numerous fire officials have said that fire retardant can enhance forest recovery after a wildfire. Ground crews also use foams to defend homes. These detergents are made of more than 99 percent water, and an anti-corrosive agent, which can cause dry skin. Animals should be kept away from foams. Crews also use “water enhancers,” which hold water, and are usually applied to wood, but can be damaging to historical wood buildings. The water-enhancers are similar to chemicals used in disposable diapers, Broyles said. “They can be very slippery and hold water in place from several hours to several days,” she said.